For the most part, Defenders of Time is a conventional tower defense game. Waves of aliens emerge on one end of the map, and I have to prevent them from reaching my generator on the other end. Maps are square-based grids, with various immovable objects that change up their layouts. Much like in the excellent Defense Grid 2, the trick is in using the towers to create a maze that will make the aliens' trip as long as possible, and picking the right combination of tower types to match their strengths and weaknesses. 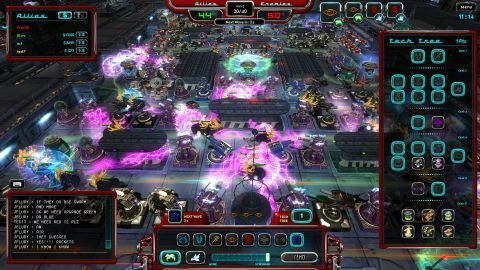 The twist is an eight-player multiplayer mode where three members of each team build towers simultaneously on separate but identical maps, while one member of each team acts as a commander, tweaking the attacking alien waves and upgrading a tech tree that unlocks new tower types for teammates. It’s interesting, but the core game just can’t make it fun. Sometimes, I reach wave 20 and the screen is just a huge mess of aliens and purple explosions that destroy my framerate. I kind of I understand some of what's happening, though the learning experience is always counter-intuitive. There's always too much going on, or not enough. Levels seem really difficult at first, and simplistic once I memorize where to put down my towers. Matches start as a crazy race to get my bearings, then slow down to war of attrition. It was hard to find any moments to enjoy in between, and when I did, there were still technical issues to deal with. I appreciate that Defenders of Time tries something new, but it misses the mark at every turn. One of the few interesting things that Defenders of Time does is use a single base tower type that can be upgraded to all other types: an area of effect cannon, a tower that slows down aliens, and others, all of which I've seen in previous games. This allowed me to think about pathing first, then quickly upgrade the base tower to one of six different types, which, when I had enough money, could be upgraded twice more. I could easily see how my different tower maze structures affected the aliens' paths and use that information to improve, but never felt that my choice of towers made as big of a difference. Alien and tower encyclopedias were added a week after launch—but only via links to the developer's website—and the tutorial mode, which already does a poor job of explaining the game's basic premise with on-screen text (without pausing the game or highlighting important elements) doesn't even bother to go into that subject. The only way to know that the purple, tesla coil-looking, Dynamo Flash tower does extra damage to flying units (which, by the way, are never fun in tower defense games), is to hover your mouse over it and read the description during a match that you can't even pause in singleplayer. The visual design, which is a gaudy mix of 'chrome-punk,' generic aliens, and random locals (Pompeii, Area 51) floating in space, fails to communicate information also. The white, Aegis Sentinel tower makes other towers near it stronger, but it doesn't look like it. It just looks like another offensive tower. This doesn't make the game visually boring, but harder to play because it's not easy to process what towers you have at a glance like you can in other tower defense games. Defenders of Time resorts to a color-coding system to tell towers apart, but it's a weak solution. There were so many explosions and aliens on screen, that my framerate dropped into the single digits. A variety of all tower types across the level got me pretty far, but never all the way. I could tell that some aliens were faster, others shielded, but at some point, the AI or commander player boosts the enemies' speed. The aliens, whose awkward walking animations are already slower than their actual speed, start sliding across the map as if someone pushed the fast forward button. It was so odd and unexpected, the first couple of times it happened I assumed I accidentally pressed a button to increase the game speed. Some of these issues are mitigated in multiplayer by the satisfaction of human cooperation and matches that can turn around in the last minute, but it also introduces totally different issues. Matchmaking didn't work at all (maybe because nobody was playing), so the only way to get into a game was to invite another player directly after seeing their name in a global chat channel. When I did finally get into a match, in addition to text and voice, drawing tools let me highlight where exactly I wanted another player to place a row of towers. It's a useful way to communicate in a game that requires coordinating with tile-to-tile accuracy, but as with the single-player mode, in the late game, the amount of aliens pouring out is overwhelming, and so visually hectic, it's hard to do anything with much accuracy or forethought. In the rare cases that I did make it far, there were so many explosions and aliens on screen, that my framerate dropped into the single digits on my AMD Quad Core 3.3GHz, 16GB Ram, GeForce GTX 660 Ti PC. Juggling multiple tasks is always a key element in tower defense games. On the one hand, doing it with three other people, who must also ask the commander player for upgrades, can be satisfying, especially since I'm modifying my existing towers to match player-customized waves of enemies. On the other hand, this concept isn’t well balanced either. The players placing towers have too much to do, while as a commander I spent a lot of time waiting to deploy new waves and for resources to trickle in. Additionally, most of the strategy is still in creating the longest maze, which is strictly about pathing, and since levels aren't randomly generated, it'd be easy to find the optimal maze for each and repeat it in every game—and Defenders of Time only has six levels. There are a couple of interesting ideas in Defenders of Time, but upon further inspection they’re poorly executed, and partly flawed at their core. Graphically, it looks like it could have been released years ago, but it still suffers from performance issues. In addition to the low framerate, it crashed several times and kept popping out to windowed mode arbitrarily. According to the archaic global chat channel, this wasn't limited to my machine. It does a poor job explaining how its multiplayer mode works, let alone its long-term appeal, which, frankly, isn't there. It doesn't feel finished or polished regardless of context, but given all the other great tower defense games such as Defense Grid 2, Orcs Must Die!, and Sanctum, it's simply a waste of time unless you can get eight friends together. And if you really want multiplayer tower defense, Defense Grid 2 does that far better as well.